We at Mountain Construction are North Carolina Timber Frame builders and International Timber Frame dealers of Hearthstone Homes. We specialize in Green Building and NC Green Home Improvements. Green and sustainable building uses products that are renewable, provide long-term energy efficiency and will maintain structural integrity far longer than a typical building. Timber Frames are, by the nature of their structure, green. When they are well insulated, especially with structural insulated panels, they provide energy savings for many years. Timber Frames can be made from oak or pine, a renewable resource. Some Frames are more rapidly renewable, such as eastern white pine. A normal, stick-framed home has walls built with 2X studs with insulation in-between the studs. This causes the R-value of the wall to become degraded. A structural insulated panel or SIP wall has more whole wall value. This results in long-term savings in dollars, minimizing the use of energy to heat or cool the home by as much as 50-60%. joinery to form the framework of the building. This beautiful oak or pine frame is planed, sanded, oiled, and then left exposed on the interior of the home, creating a breathtaking effect of open spaces and craftsmanship rarely seen this century. The exterior of the frame is covered with a highly energy-efficient blanket of foam core panels. The result is a home of unmatched beauty, value, energy efficiency, and design flexibility. Generally, the look is less rustic than a log home, yet the core skills and a reverence for wood are the same. The Timber Frame system provides a lot of variable for Design variations. It can be used to build a home that is very contemporary or very rustic. It is also a great option for period reproductions. Any species of wood can be used, even recycled timbers. A wide variety of surface finishes, from rough to smooth, can be used. The surfaces can be planed and oiled or hand hewn or weathered for an antique look. A Timber Frame can be paired with stone or log accents for contrast and a unique custom design. Your home's appearance should be aesthetically pleasing. A green home should be well sited, taking advantage of the sun's rays in the winter to heat the home. Since Timber Frames are built in a controlled factory environment, there is little wasted wood. It is an important concept to make the best use of all the materials. The Timbers themselves provide thermal mass that can absorb the heat during the day. 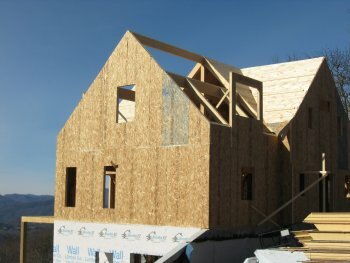 A well-sited timber frame with structural insulated panel enclosure goes a long way toward building a better more well insulated home. Mountain Construction are North Carolina Builders that specialize in New Home Construction. 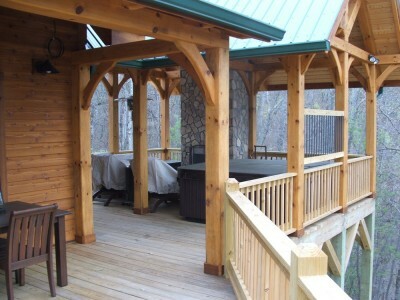 We also can provide Remodeling services, and are happy to work with you as Log Cabin Builders. 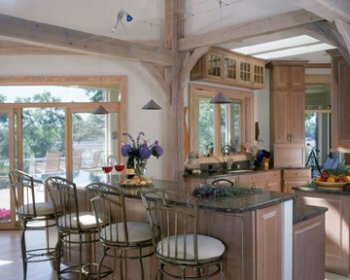 Over the years, we have accomplished a great deal as Timber Frame Builders and we invite you to take a look through our site to see some examples of our work.